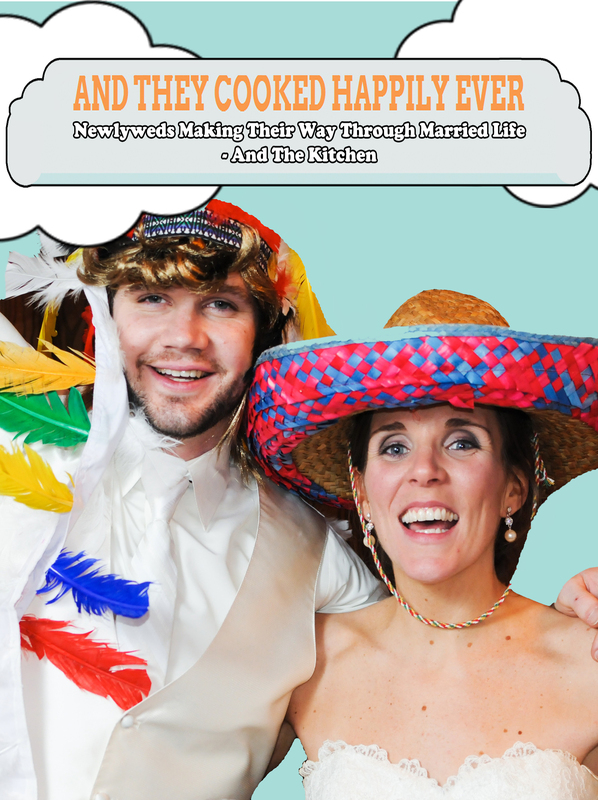 Those of you out there who are married know how fast the big day goes by – you plan for weeks, months, years even, making sure every last detail is perfect. You lay awake at night (as your “not-stressed-about-the-details” fiance snores away next to you) wondering if it’s all going to go according to plan, playing it all out in your head over and over and over. Then the day finally comes and it’s a blur of aisle walking downage, photo taking, bite of cake eating, 2 bites of dinner eating, “thank-you for coming” repeating, dancing (if you’re lucky) and BOOM it’s over – like THAT! For us, selecting the perfect signature drink for the night was a big deal. 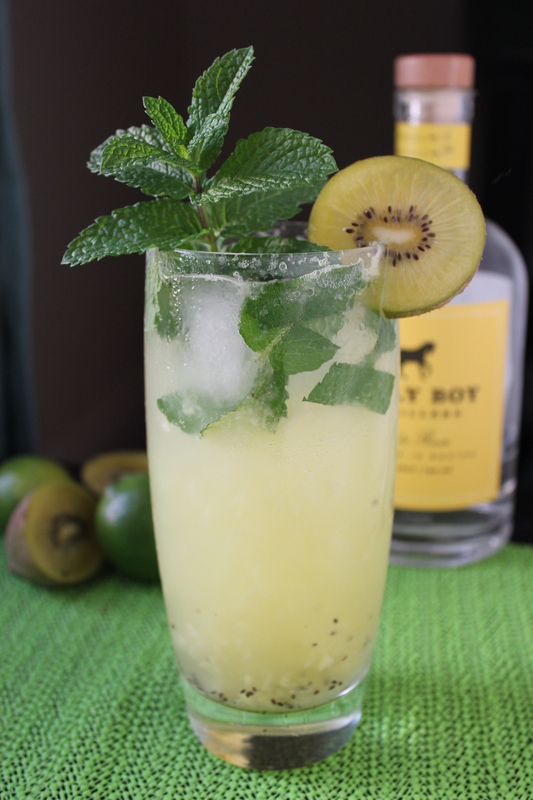 We did lots of brainstorming, and once we figured out what the perfect drink was, we did lots of research and experimentation – and the perfect drink was a Kiwi Mojito, a tribute to our honeymoon trip to New Zealand, a.k.a “kiwi land”. I remember at the wedding, seeing our perfectly planned out Kiwi Mojito in the hands of many guests, thinking “augh, man I gotta get my hands on one of those!” and then next day, as we reminisced over our wedding day, that we couldn’t believe had just come and gone, we both realized that we never got to try one of those damn mojitos! DOH! So hey, better 4 months late than never, eh? *yields 2 drinks – it is only Monday afterall! 1) To make the simple syrup: break up the 2 sliced kiwis with the bottom of a wooden spoon to release the juices, then add the 10 mint leaves, 1/2 cup water and splenda and boil over low heat until all the splenda dissolves. 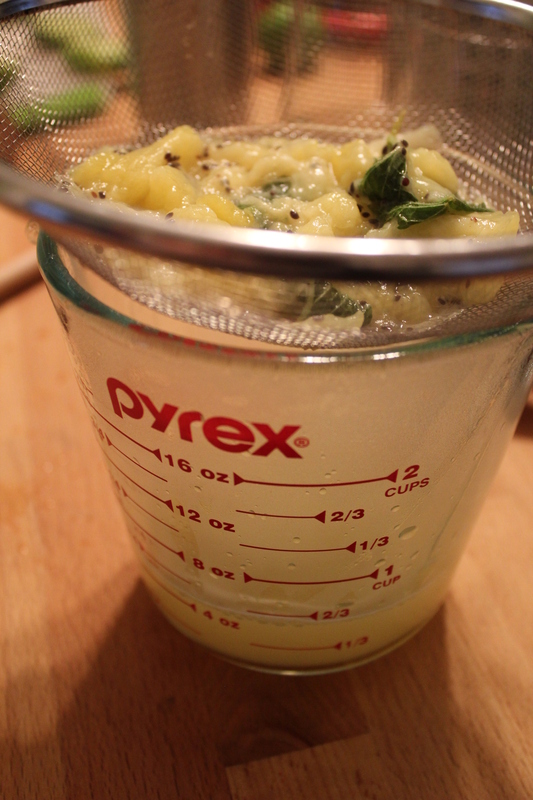 Drain the syrup through a mesh strainer and let cool. 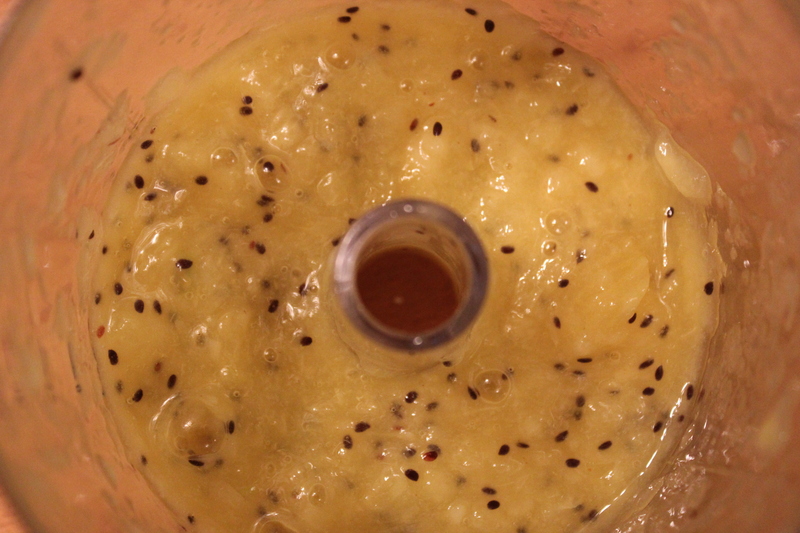 2) Take the rest of the kiwi slices and blend in a food processor or blender. 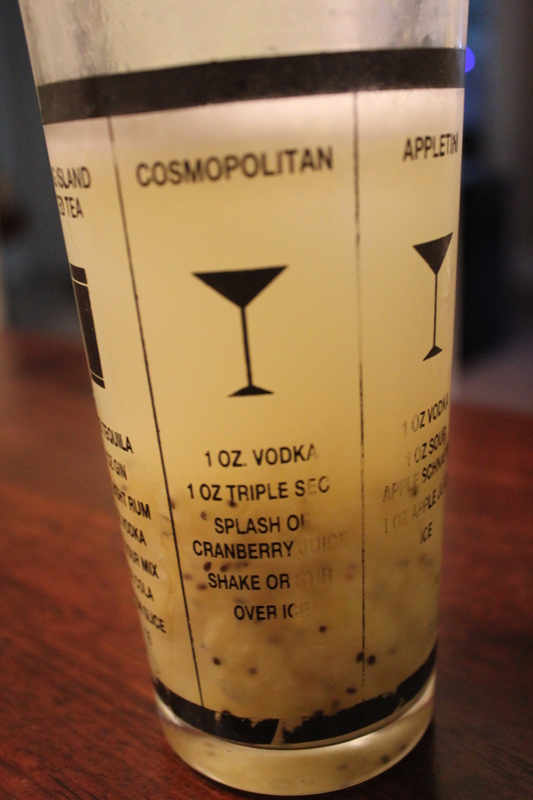 3) In a cocktail shaker, combine the blended kiwi, 6 tbsp. 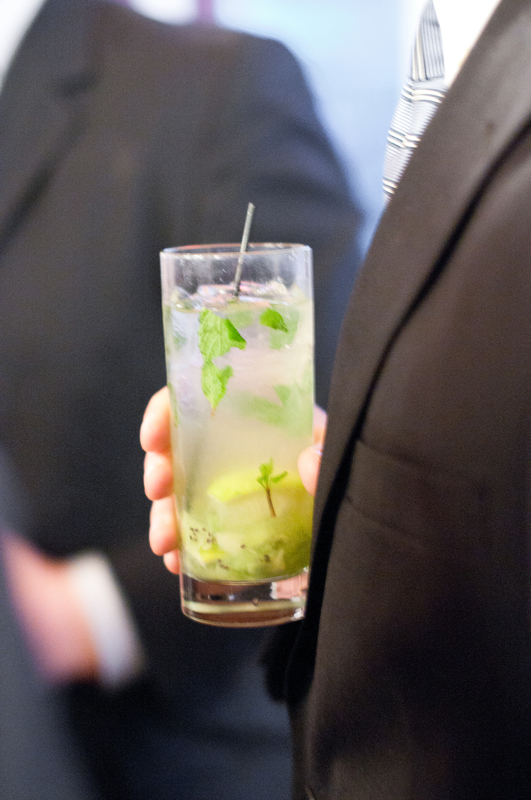 of simple syrup, 2 shots of rum, juice of 2 limes and chopped mint leaves. 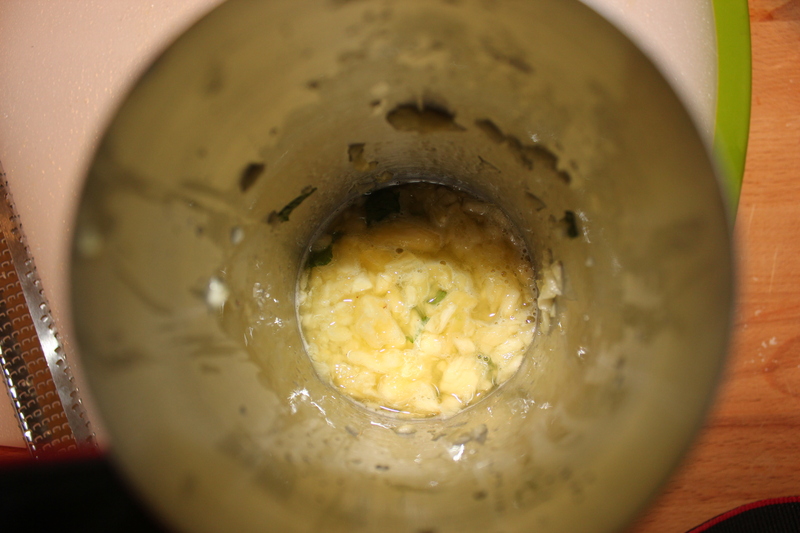 Muddle with the end of a wooden spoon or muddler and then shake until fully combined. 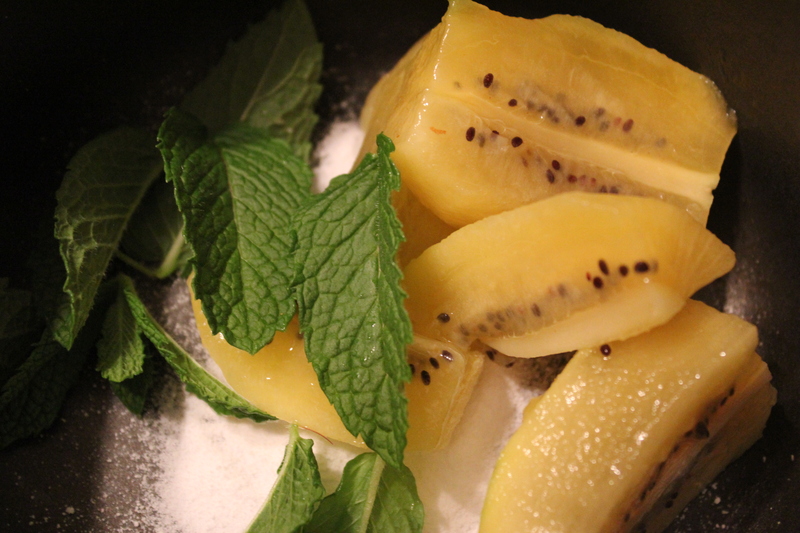 4) Fill a tall glass with ice and fill half with the kiwi/rum mixture and top the remainder off w/ seltzer water. Boy were these worth the 4 month wait! They tasted fresh and light, a great summer time drink that all in all, isn’t too bad for you either! 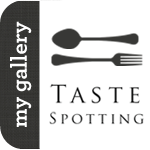 Using the splenda in the simple syrup can really save some calories, but of course you can use sugar. It should also be noted that by mistake, I bought Gold Kiwis – which I didn’t even know existed! 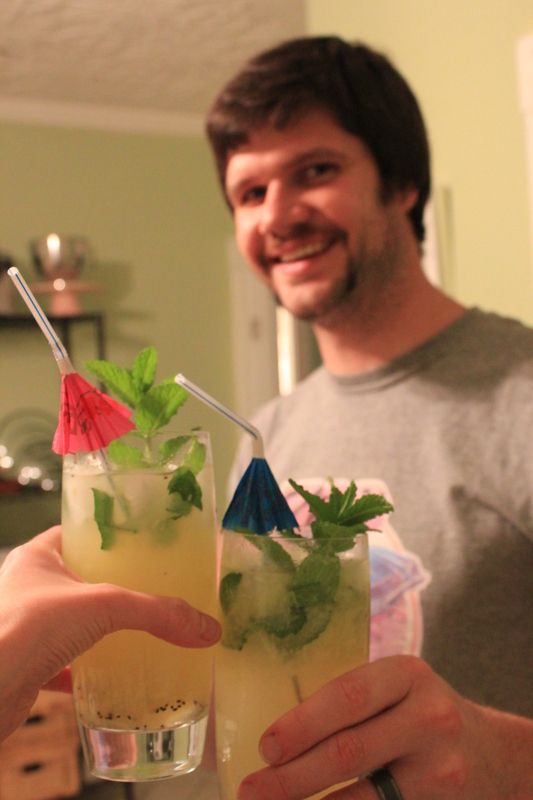 However, they tasted pretty much the same and made the drinks really pretty! 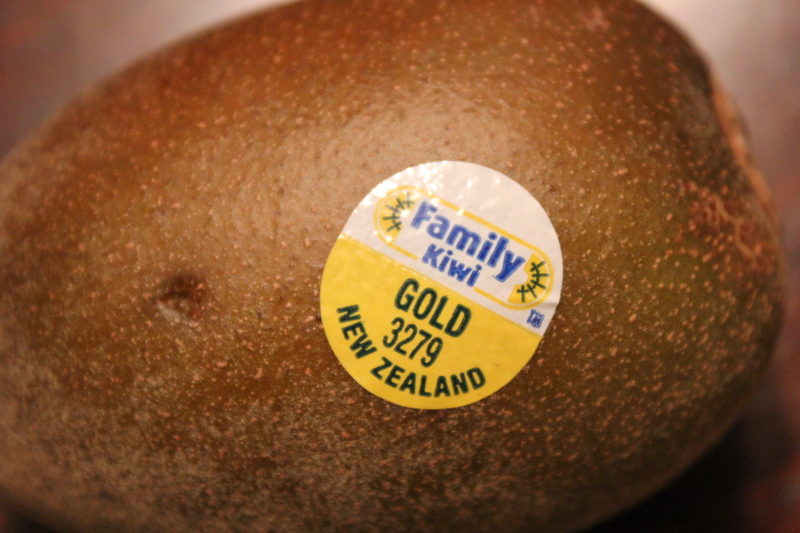 Gold Kiwis – who knew? So Happy Monday, and cheers to 4 months! It’s Thursday – and I LOVE Thursday – it’s like Christmas eve in a way, because the next day is FRIDAY, by far the best day of the week! It’s the only day where you know that the next 2 days are yours free and clear (well hopefully they are anyway). In college, Thursday was the start of the weekend (well, for some Monday was) but for most, it was a great excuse to head out for a pre-weekend bevvie – or two – or ten. And so now even though I’m years away from college, I still get nostalgic every now and again and think “hey, just because I was in college so long ago that Facebook wasn’t even invented yet, I can still have Thirsty Thursday too!”. 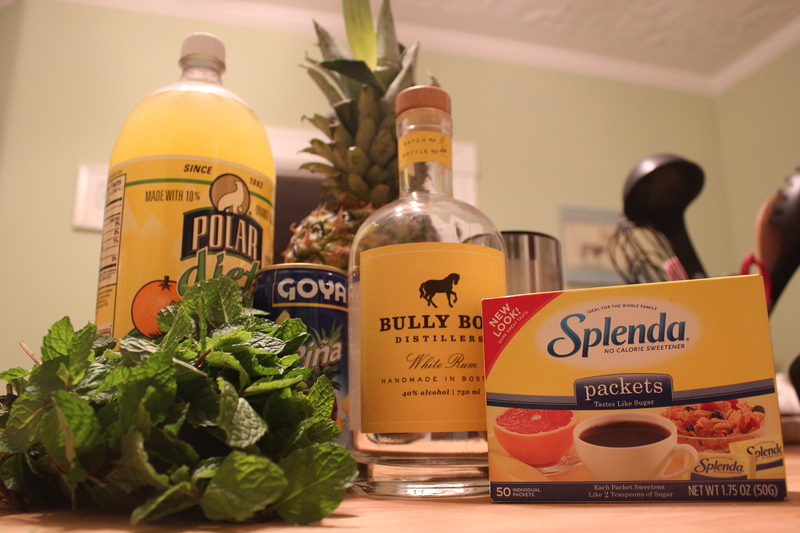 So tonight, on Thirsty Thursday, I’m doin’ it – I’m going to try to recreate this amazing drink that I have in my head too many times to be called normal, and while I’m anticipating that it won’t be quite as delish as it is having a handsome Latin bartender make it, I’m hoping maybe it will be a close second. 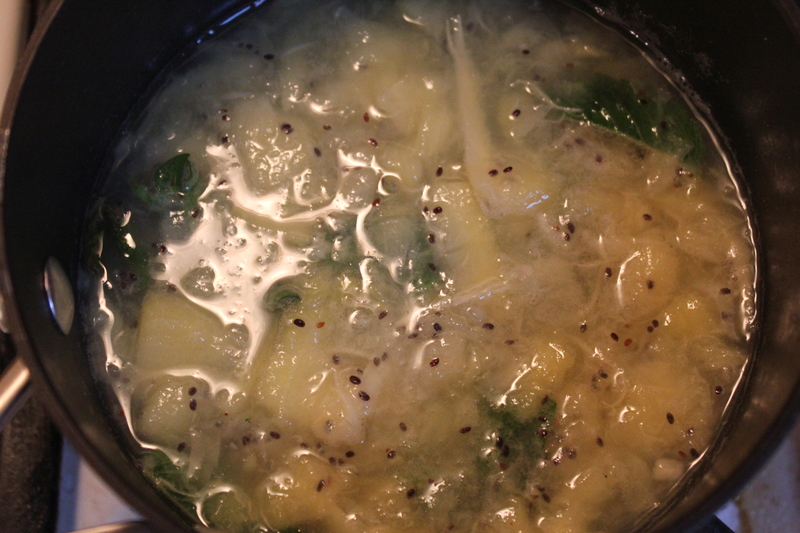 1) Muddle together pineapple chunks (which I threw in the food processor to make a little smaller, but it’s not absolutely necessary) and mint leaves. 2) Add simple syrup, lime juice and rum and shake together to mix. 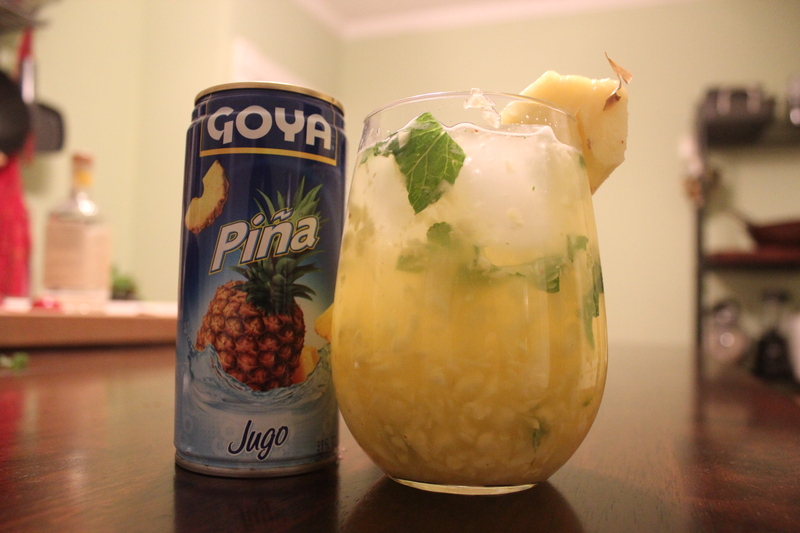 My very own pineapple mojito – maybe not quite the same as Orinocco’s, but mine was still delicious and refreshing and not too too bad for you if you weigh out the ingredients and their nutritional value (really the only source of calories coming from the pineapple juice and the rum). So cheers to thirsty thursday and even more importantly – to FRIDAY!